I consider myself a portrait photographer. My subjects are plants and animals, and I hope to evoke an emotional response. Image size: 15½ x 23"; paper size: 27 x 33". Edition 30. Photogravure printed on gampi paper chine collé. Image size: 15 x 11½"; paper size: 23 x 18½". Edition 20. Image size: 8 x 11¾"; paper size: 15 x 17¾". Edition 30. Image size: 20½ x 16½"; paper size: 30¾ x 25½". Edition 30. Susan Middleton is a photographer specializing in portraits of animals and plants. She has been photographing rare and endangered species since 1986, and her work, with collaborator David Liittschwager, is collected in four books, two published by National Geographic Books and two by Chronicle Books. The working process developed by Middleton and Liittschwager is documented in an Emmy Award–winning National Geographic television special America’s Endangered Species: Don’t Say Goodbye, 1997. A book of Middleton’s photographs with text by Mary Ellen Hannibal, Evidence of Evolution: Darwin’s Cabinet of Curiosities will be published by Abrams in September, 2009. Susan Middleton was born in 1948 and holds a BA in sociology with a minor in art from Santa Clara University, California. She apprenticed in photography by working as an assistant to Richard Avedon. Middleton chaired the department of photography of the California Academy of Sciences, San Francisco, from 1982 to 1995. In 2006 she produced a thirty-minute documentary film focusing on animals and plants of the northwestern Hawaiian Islands. Middleton has said that she isolates her subjects from their environments so we can perceive them as individuals, “each in its own right.” Many locations where she shoots are in remote and difficult terrain, and often she must wait long periods for an animal to become comfortable in the setup she creates for the photo. “When I photograph an animal, I always wonder how we, as humans, are known by that animal,” she has said. Her photographs have been exhibited in many museums, among them the American Museum of Natural History, New York; the National Academy of Sciences, Washington, DC; and the California Academy of Sciences, San Francisco. Her work is in the collections of those institutions and the Center for Creative Photography, Tucson; the Museum of Fine Arts, Houston; and the Honolulu Academy of Arts, among other public collections. She makes her home in San Francisco, California. 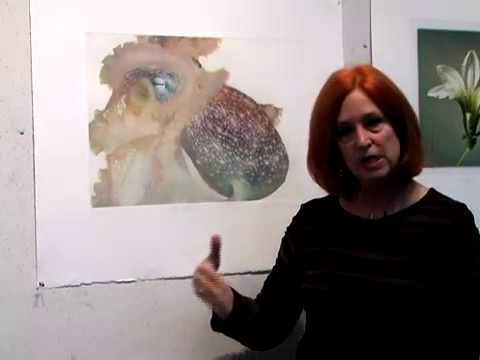 Artist Susan Middleton describes making a color photogravure at Crown Point Press in San Francisco, 2008.